3 Ways We’ve Created a Sense of Purpose at LinkNow Media ‹ LinkNow Media | We're Hiring! We can only speculate that had this happened in 2019, Kennedy would’ve immediately poached the man for a leadership role on his team. Why? Because the man had vision. He could see very clearly—more clearly than most—that every job contributes to a greater purpose. Every job has meaning. And it’s important—no, crucial—for company leaders to make that vision, that meaning, clear to their employees. If that is, they want productive, committed employees who are in it for the long-haul! It works for us at LinkNow Media! 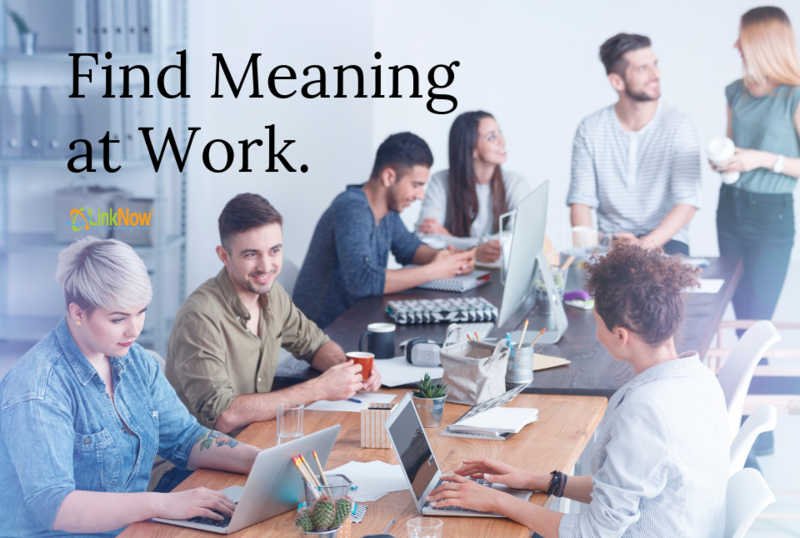 So, we’ve put together a list of the top 5 ways we’ve created and fostered a strong sense of purpose and meaning at work. Read on and leave a comment below. First, you need to clarify your vision for yourself. Then you need to clarify it for your employees. At LinkNow, we’ve had a clear sense of direction right from the beginning. When we started, we were all about making web design accessible to small business owners. Our goal was to corner the market—and we did! When it became clear that a website without SEO and digital marketing services isn’t much good, we shifted direction towards competitive marketing packages. It was a natural move and one which, with all the employees on board, went very smoothly. We didn’t forget about web design—it was simply integrated into a broader marketing strategy combined with Local SEO, organic SEO and content marketing. Because everyone on our (ever growing) team is on board and working together, each employee can get a real sense of their personal contribution to our overall success! That’s the power of vision! When you’re down in the trenches, doing task after task at lightning speed, it can be easy to lose sight of the end goal. That’s when a clear vision needs to be paired up with a desire to do good work. How do you do that? One of the best ways is to identify individuals who exhibit leadership potential and give them a few more responsibilities. Make them a team lead (even if that team is relatively small). That way they’ll be responsible for all the knowledge and skills that they use every day—a constant reminder of their skills and of their value to their team and to their managers. Creating leadership roles will also give newer employees something to strive for. Another strategy we’ve adopted is giving accounts that require special attention to top-performers. This transforms the uniformity of daily tasks into one of great responsibility. The results? Happy clients. Happy managers. Happy employees with a sense of purpose. One of the things that makes LinkNow Media so special is that management listens to employees when they have ideas for new approaches and criticisms of current processes. We leave our egos at the door. The result is a team of people who feel valued for their own experience and eager to improve our services. This is creative thinking at its best. Discovering the problem that no one noticed and finding the solution. When people see their ideas being put into practice—with due credit given—they can be proud knowing that they made a change and that their voice was heard. We make sure that LinkNow Media feels like an open platform where honest discussions can happen. And it’s one of the most successful things we’ve done to foster a sense of purpose in the workplace! Want to join a dynamic team of young professionals excited about offering top-tier digital marketing and web design services? Apply today!